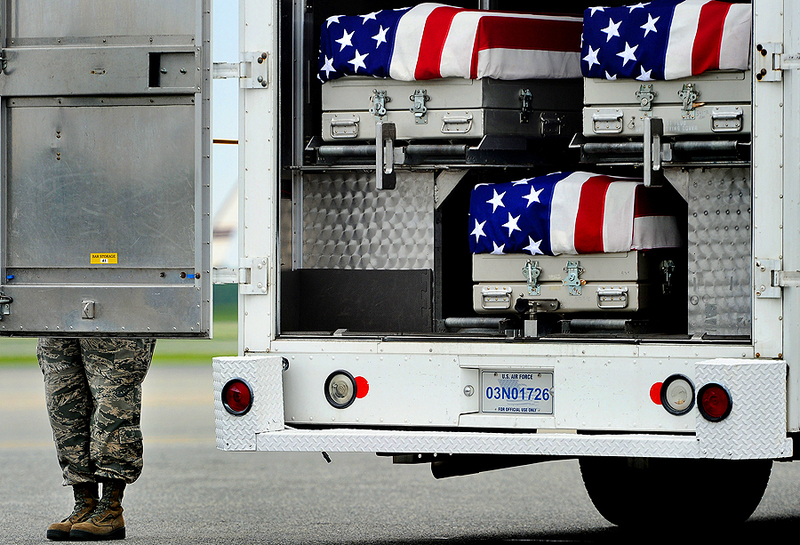 "A U.S. Army soldier shuts the door of the transfer vehicle as flag-draped transfer cases lay secure containing the remains of five U.S. Army and U.S. Navy soldiers, during a dignified transfer at Dover Air Force Base, on August 19, 2012 in Dover, Delaware. Those killed were serving in the U.S. Army in support of Operation Enduring Freedom in Afghanistan during a Black Hawk helicopter crash, which was one of the deadliest air disasters in the nearly 11-year-old war. Among them killed and part of this dignified transfer were: U.S. Army Chief Warrant Officer 3, Brian D. Hornsby, U.S. Army Chief Warrant Officer 2, Suresh N. A. Krause, U.S. Army Spc. James A. Justice, U.S. Army Spc. Richard A. Essex, and U.S. Navy Petty Officer 1st Class Sean P. Carson." I once again had the great honor of covering of dignified transfers at Dover Airforce base. While not apparent to me at the time, I took the time to read articles online about those that lost their lives at the cost of war during this solemn return. Those fallen in this dignified transfer were some in a U.S. military helicopter crash during a firefight with insurgents in a remote area of southern Afghanistan - which killed seven Americans and four Afghans. From what I've gathered, it was one of the deadliest air disasters of the 11-year war, and at least 1,961 U.S. service personnel have been killed in Afghanistan since the start. I thank the families of the fallen for allowing the media to photograph these transfers, as it's important not only to them, their communities, but everyone reading the news the next day. 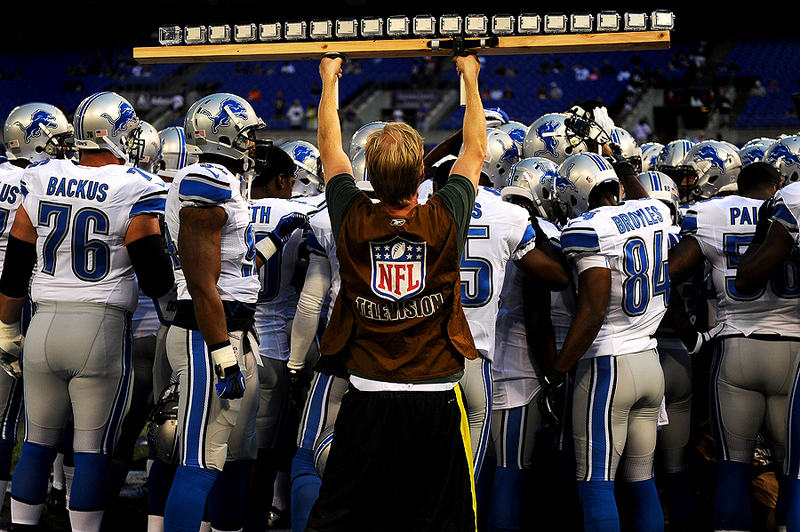 "An NFL television camera operator holds up a rig of 20 GoPro cameras on it before the Detroit Lions play the Baltimore Ravens in a preseason NFL football game at M&T Bank Stadium, August 17, 2012, in Baltimore, Maryland." As a photographer on the sidelines covering professional sports, everyone is familiar with other photographers. Most of us cover the same news events and same sports teams locally, and even when there are fresh faces on the sidelines from out of town, this industry is so small everyone knows him or her, too. It's safe to say, with the exception of television operators, everyone knows everyone. So I do my part to photograph other photographers on the sidelines during timeouts and so forth. In my mind, I'm documenting all aspects of the game, and as morbid as it may sound, I want the memories of my buddies on the sidelines. With that said, every once in a while you'll catch another professional roaming the sidelines doing something extraordinary. Much like the frame above, this television operator caught the eye of everyone on the sideline during pregame as he slung around 20 GoPro cameras on a rig. Not only would I love to see the clip, but I want to pat him on the back for giving me something to tell everyone about. This was the ultimate hail mary. 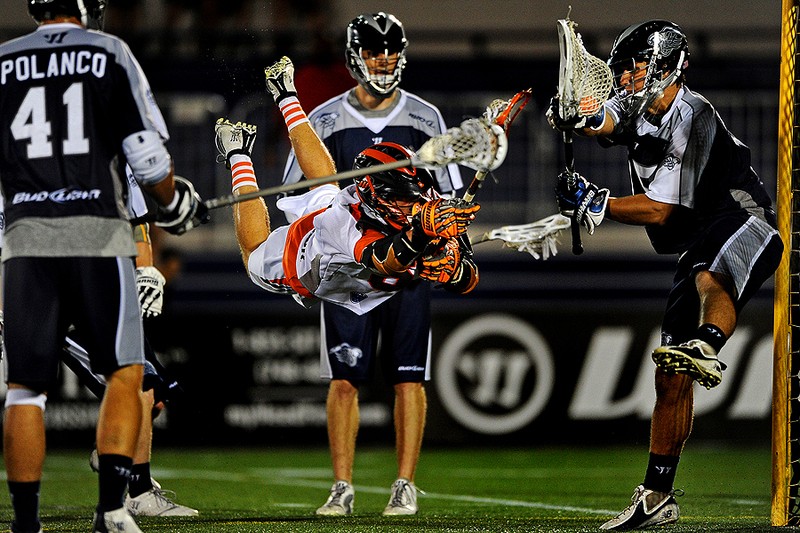 "Peet Poillon #57 of the Denver Outlaws dives across the crease for a shot as goalkeeper Kip Turner #15 of the Chesapeake Bayhawks makes the save in the second half of a Major League Lacrosse game at Navy-Marines Memorial Stadium on August 11, 2012 in Annapolis, Maryland. The Denver Outlaws won, 15-13." A lot of sports are common for professional photographers to shoot. However, I think a large majority have never photographed lacrosse, even those in the United States. Only recently has lacrosse really become more mainstream, migrating west and there becoming a professional league. When I'm asked what it's like to shoot, I always give the same explanation. It's the fastest game on two feet and a combination of multiple sports, mostly to the likings of football, soccer, hockey, and basketball. It's also a sport I tend to shoot the heaviest because of fast play, obscuring helmets and at times very aggressive play with sticks. With any sport, the various levels of play changes everything, and mostly speed. But what I love about Major League Lacrosse is the risk, reward of the players shots. The rules allow for more points, diving into the crease and more showboating. It's not often you get a player soaring across the goal unguarded, so it's always a treat when you see in coming your way. 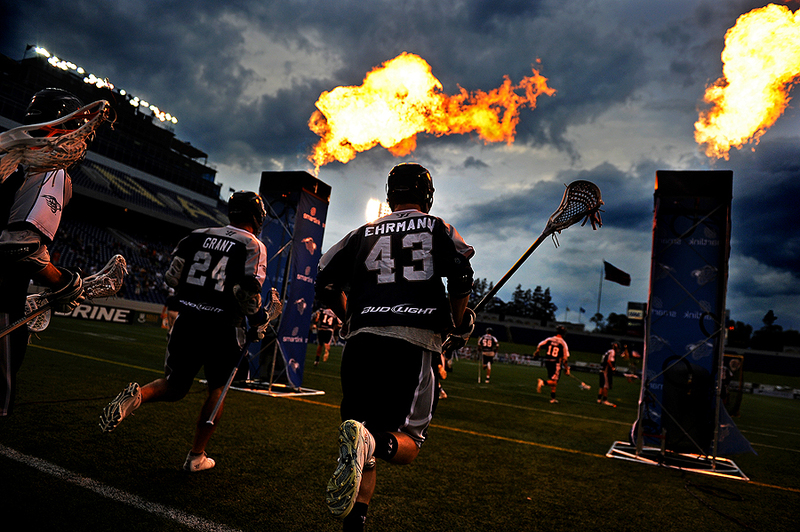 "Barney Ehrmann #43 of the Chesapeake Bayhawks takes the field with teammates before playing the Denver Outlaws in a Major League Lacrosse game at Navy-Marines Memorial Stadium on August 11, 2012 in Annapolis, Maryland. The Denver Outlaws won, 15-13." About two weeks ago, I had the chance to cover the final Chesapeake Bayhawks lacrosse game of the season in Annapolis, Md. Originally, I was scheduled to cover ninety percent of the Bayhawks home games for Getty Images, but I was pulled from most of them for other events including Belmont and NASCAR, among other things. These games are very fun to photograph, especially later into the summer as the light gets better and better. Not to mention, the access is basically unrestricted; something we as photographers don't see much in the sports world too often. Next season I hope to try and explore that a bit further. Nonetheless, the last game of the season turned from a lovely sunny summer day, to a typical summer evening with thunderstorms. After a 45 minute delay, the game was underway. Unlike at some stadiums where all photographers need to be at safe distance away from the players and identical pyrotechnics, I get the chance to give viewers the vantage if they were a player themselves running onto the field with the Major League Lacrosse. Got to love access like that. Can't wait for the season to start back up next year. 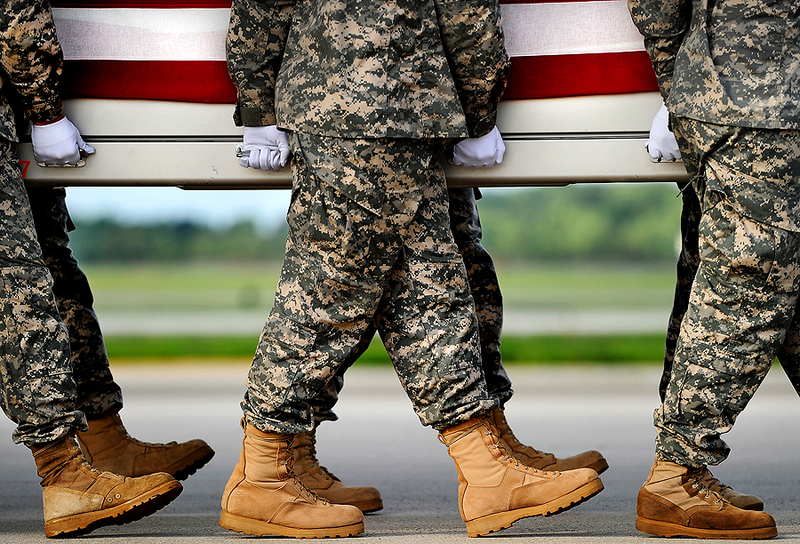 "Army soldiers carry the flag-draped transfer case containing the remains of U.S. Army Maj. Thomas E. Kennedy, during a dignified transfer at Dover Air Force Base, on August 10, 2012 in Dover, Delaware. Kennedy, who was from West Point, N.Y., was killed alongside two other American troops while serving in the U.S. Army in support of Operation Enduring Freedom. Kennedy was assigned to Headquarters and Headquarters Company, 4th Brigade Combat Team, 4th Infantry Division, Fort Carson, Colo."
Last week, I had the great honor of covering a pair of dignified transfers at Dover Airforce base for Getty Images. Soldiers whom have fallen at the cost of war are brought home through Dover. From the aircraft to a transfer vehicle, a carry team of military personnel give honor to those who have given their lives in the service of the United States. The vehicle then moves the fallen to the mortuary. For those unaware, in 2009, the Secretary of Defense announced a change in policy that, upon consent of the family of the deceased, allowed media access to cover dignified transfers. It's a beautiful show of honor, respect. As I mentioned, it's a humbling honor and opportunity to photograph these transfers, and it's important to honor the fallen for their service. These images hopefully resonate not only to those in the fallen's hometown, but everyone reading the news the next day worldwide. 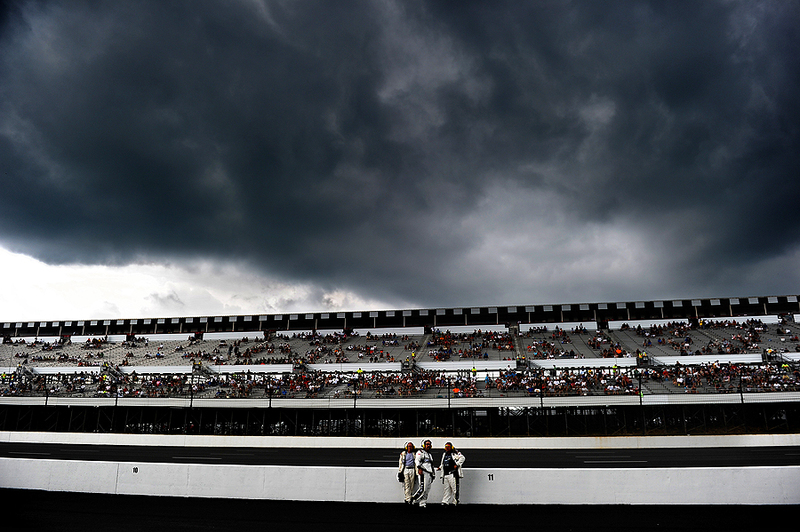 "NASCAR Sprint Cup Series Officials stand on pit road before the start of the NASCAR Sprint Cup Series Pennsylvania 400 at Pocono Raceway on August 5, 2012 in Long Pond, Pennsylvania." When it rains - you get drenched. Standing on the grid minutes before NASCAR Sprint Cup Series Pennsylvania 400 at Pocono Raceway, I think everyone knew it was going to rain. Maybe I thought it would pass, because minutes after I shot the above frame, it rained uncontrollably. 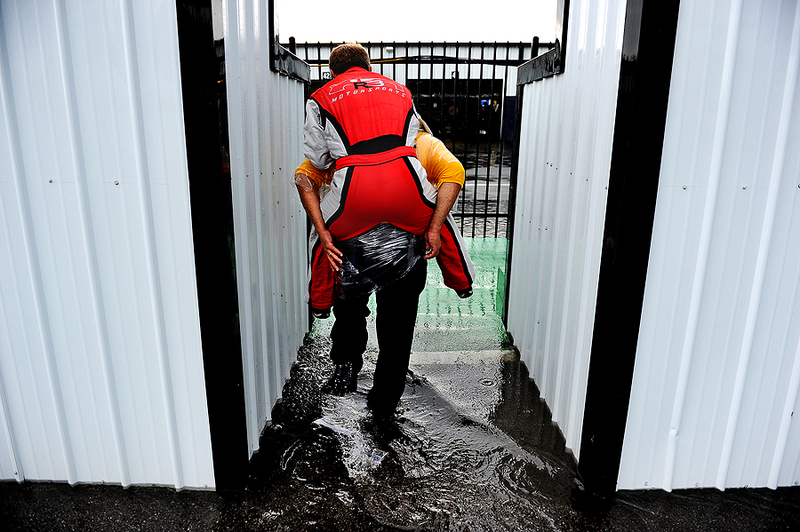 Without anywhere to run - no rain coat, and more importantly, no rain covers for my gear - I was stuck under a pit road covering with a driver and a pair of fans. 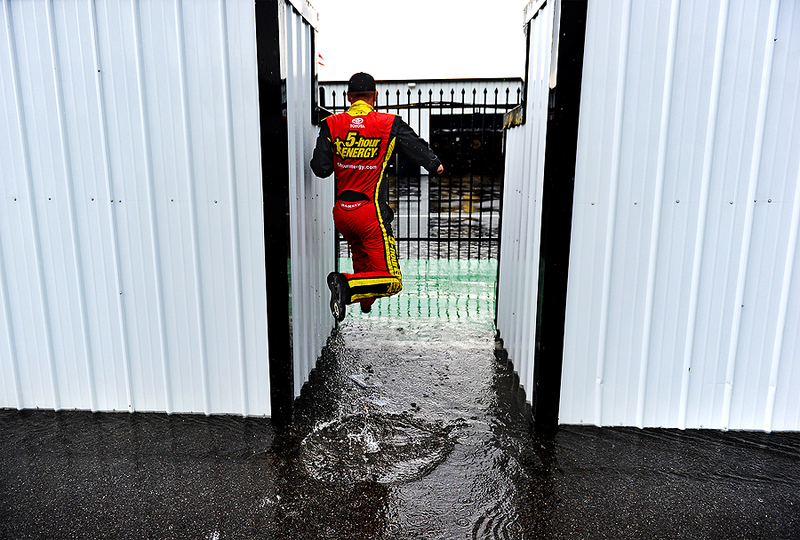 Time and time again, I tried to run back to the media room to get some pictures of the impending storm and drivers trapped on the grid back to my editor. But the rain was heavy and strong wind gusts grounded everyone. It wasn't until I decided to make the run back that my images went from ominous and newsy to light-hearted and funny. More to come. "During slack calm tide, wild horses swim across the 75-yard Assateague Channel during the 87th annual Chincoteague Island Pony Swim on July 25, 2012, in Chincoteague, Va."
The drive was almost four hours, the hotel ranked as one of the grimiest I ever stayed and I had to be up before the sun. 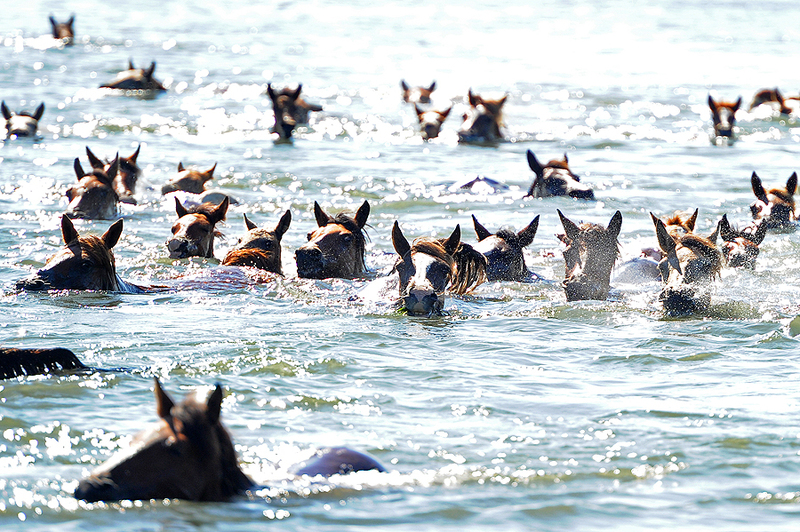 But it was all worth it getting the opportunity to photograph the 87th annual Chincoteague Island Pony Swim. I made a list of Maryland related stories I wanted to document when I moved back to Maryland, and while I've got the opportunity to shoot most, the pony swim was one I missed last year. This summer, on the last Wednesday of July, I didn't miss it. In short, saltwater cowboys round up wild horses, and then they swim across the 75-yard Assateague Channel. Without pecking at the keyboard longer than I need to, it was a lot of fun. I started the day in the mud as the sun rose, trekked around in the brush and water to make features, waited patiently on the beach for the swim, had my heart race as horses kicked and bucked feet from me, and sweated as I chased them down the more than two mile walk down the street. Yet, totally worth it, and had some friends shooting the event that made it twice as exciting. Would love to bring longer glass and possibly get on a boat if I ever shoot the event again, but until then, I can scratch this off my list.